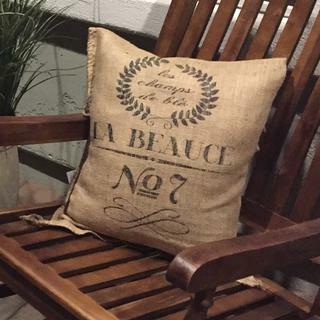 These reproduction French grain sacks, printed on environmentally-friendly, hydrocarbon-free burlap, sport a faded black wheat crest design, and the words "les champs de ble; La Beauce." Rustic and elegant, each bag's printed design has slight tonal variations. They make beautiful pillows, cushion covers, and decorative accents. The bags may or may not come with a thin red stripe along the outer edge as shown in the image. I chose this burlap bag, because the lighter gray print is neutral to go with any of my décor. I like to take these bags and frame them and put them on the wall for a rustic, French country look. This is going to be perfect to make two French-mattress style floor cushions. I have been looking for a fabric I like, and these grain sack reproductions will actually work better than anything else I have found! I am going to cover a foot stool. Hoping to make valances for my new home! I'm going to alter this for a decorative pillow for my guest bed. 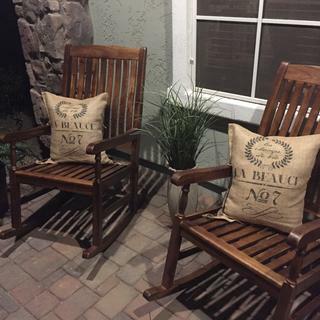 I plan to make throw pillows for my front porch rockers. I have 18" x 18" pillow inserts, so I will cut to size keeping the design centered. I like the stencil on these bags so I will be filling them with items that I use for my photography and they will look great in my home. completely excited. oh i love this so much. your selections are amazing. I want to make pillows out of these! been wanting this for two years because my maiden name is LaBeau. I hope I can just cover the last two letters(CE) with burlap flower or something.Finally ordering it. I want to make a pillow from it and I read many reviews that made it sound like a great idea. My style is vintage european but my pocketbook doesn't support authentic grainsacks from europe! This is a nice alternative to achieve the look I want! I just stumbled across them while searching for affordable grainsacks and so glad I did! To make sofa pillow covers. I saw this bag used in a crafting "DIY" blog, I loved it the moment I saw it and since the Blogger gave the link to OLFS, I just had to have one for my home...I love the French Country Cottage look...so this will be a great addition to my decor! Great pricing too!! I plan to use this for a decorative pillow. To make throw pillow with. To make throw pillows to complement my French country family room. As a backing behind chicken wire in a picture frame. Upholster a chair and it looks perfect for that!! Love the French look!!! BEST ANSWER: You could, but I would probably cut it apart and use the back panel to add to each side making it wider. Otherwise it isn't very wide unless you have a skinny window. Another way to use it would be to cut it down the middle on the back panel and then hem a rod pocket across the whole thing? Good luck. Yes, many people use this bag for kitchen curtains. Where is the drawstring on the bag? I would like to put this over a chair. BEST ANSWER: The opening is at the top. So you would have to open the bottom and close the top in order to put over a chair back. This bag does not contain a drawstring. BEST ANSWER: I soaked mine in hot water in the tub in case the printing ran....it didn't. So I would say it is washable. But washing burlap bags in your washer should be done with them enclosed in a washing bag or something because they release a lot of fibers which can cause issues with your washer drain. Same thing if you put them in the dryer....use a bag. What is the height of the design from top to bottom? BEST ANSWER: 15&1/2" top to bottom of printing. Is the opening at the top or bottom as pictured? BEST ANSWER: It's at the top. Will the print wash out or fade if/when i wash the sack? Does anyone know if the width of these sacks total 18" or just when lying flat, so if i cut the sack to fit a chair to recover I will have 36" in width to work with? BEST ANSWER: When laying flat the width is approximately 18". This is a bag that can be opened correct? I want to use to cover chair pads but it's not quite wide enough so would have to open. BEST ANSWER: Yes, that would work. How stiff is the burlap? Would they pleat/drape nicely for window valances? BEST ANSWER: It's not real stiff, it should hang ok especially if you cut it to make it a single piece of fabric. Do you have other designs? I’m looking to frame 3 grain sacks on a large wall. When opened up, what's the diameter of the opening? I assume the width of 18 inches is when it's lying flat? Will this work as upholstery fabric? I need a rather heavy weight for a sling-style antique spring-rocker chair...there’s no board or cushion for supporting in either the seat or back, right now it’s a fabric sandwich with padding sewn into the seat. I was super excited to get these and make them into pillows for my front porch. I love a touch of French Country, these were perfect! I put in an 18" pillow form, folded down the top and stitched down the sides to secure. No cutting necessary. This is the perfect pillow cover, I just added lace to the ends and Voila! Love these! I have several projects planned...pillows and covering a chair back among them. I washed in warm water and dried them to soften slightly and pre-shrink. I used this bag as a gift bag for 3 different types of tablecloths I made for a gift. The recipient can use it to store her linens or hang it as a piece of artwork. Great item. I luuuuuv anything French!! These bags are great!